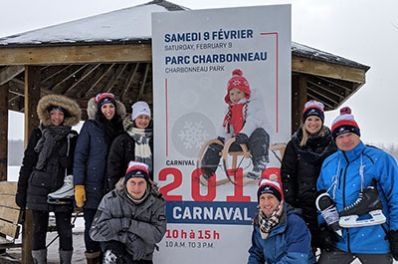 ROSEMÈRE, January 23, 2019– Mayor Eric Westram invites Rosemère residents to come to Charbonneau Park between 10 a.m. and 3 p.m. on Saturday, February 9, to take part in this year’s carnival. The event has become a tradition for many local families who appreciate the festive spirit of this annual outdoor get-together and the opportunity to experience the joys of winter. Among the new features the Town has introduced this year is an obstacle course. The bootcamp-style circuit will include a series of fun, family-friendly challenges. There will also be a new axe-throwing competition for ages 13 and up, as well as a circus workshop for kids. As in past years, carnival-goers are invited to bring their sleds and skates to make the most of the giant slide and rink that have been set up in the park. These activities and the sleigh rides in the neighbouring streets and along the banks of the Mille Îles River are the core activities that participants look forward to every year. Representatives from Cardio Plein Air will also be on site from 11 a.m. to 1 p.m. to encourage people to move and stay warm. Other activities include the ever-popular inflatable play structures and maple taffy on snow. Plus, refreshments will be sold at a nominal price by the 49th Lorraine-Rosemère Scout troop. Note that the carnival will be cancelled only in the event of heavy rain. If in doubt, residents can call the Recreation Department on February 9 at 450-621-3500, extension 7380, and listen to the recorded message or check the Town’s website or Facebook page for updates.